April 11, 2018 April 11, 2018 No Comments on Manitoba: Student-centric history curriculum? This month in our history education series, I’ll be looking at Manitoba’s social studies curriculum. A review of their website and recent news articles suggests that Manitoba strives to be student-centric and responsive in their curriculum. Last year, Manitoba established a new Indigenous-focused school system with a new curriculum, and while most of the provinces heard the call to action from the TRC over the last two years, Manitoba was one of the first provinces to add residential schools as a mandatory part of their curriculum in 2010 and expanded these requirements post-TRC. Recent editorials (fall 2017 and winter 2017) lambasting a skills- or inquiry-based curricula have made little impact on Manitoba curriculum, with their social studies curriculum recently updated with an inquiry focus. If you’ve been following this series, the skills- and/or inquiry-based focus of Manitoba’s curriculum shouldn’t surprise you. Similar to other provinces, any curricular revisions post-2011 explicitly are tied to Peter Seixas’ Historical Thinking concepts. The Manitoba 2014 revision of the grade 11 Canadian history curriculum includes Historical Thinking as a way to organize history teaching, but the current elementary curriculum updated in 2003 also includes skill-based concepts to organize the curriculum, only without the Historical Thinking language. As the Manitoba editorials demonstrated (see here and here), this approach is often criticized by conservatives looking for a clear and distinct narrative about Canada to be taught and learnt in Canadian schools. As an upcoming post about Alberta will discuss, sometimes these debates become part of political platforms in ways that stunt, rather than expand the conversation about history and social studies curriculum. However, a skills- and/or inquiry-based approach to history education puts greater emphasis on students’ active learning and thus can be argued to be a more student-centric way of organizing history. In Manitoba, the social studies curriculum includes history, geography, social sciences, and humanities. 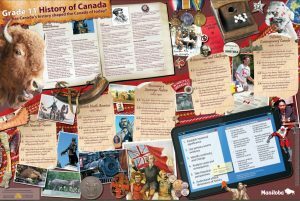 Canadian history is explicitly covered in Grades 2, 4, 5, 6, and 11. There is also a general grade 9 course, “Canada in the Contemporary World,” which includes historical considerations but are not constituted by them. 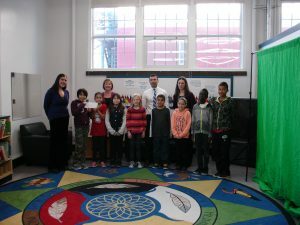 The organization of Canadian history in Manitoba elementary school is fairly standard in comparison to other provinces, with an early regional focus (“Grade 4: Manitoba, Canada, and the North: Places and Stories”) and a clear division between pre- and post-1867 (grade 5 is before 1867, grade 6 is after). The high school Canadian history course, however, is unique in its temporal focus. While many provinces start their high school history class where their elementary history left off, Manitoba’s grade 11 course, “History of Canada,” is organized into five “clusters” beginning with first peoples and ending with contemporary Canada. They also organize their curriculum with “enduring understandings” organized into five themes: First Nations, Métis, and Inuit peoples; French-English relations; Identity, diversity, and citizenship; Governance and economics; and Canada and the world. As a tangent, in this series, the more I see of themes like the ones in the Manitoba curriculum, the more I see repetition in the language and the conceptualization of how we are to teach and learn Canada. While a skills- and/or inquiry-based approach to history is intended to move students away from passively learning a common narrative, the repetition of themes across different Canadian curricula suggest that these themes, and the question that come from them, become the narrative; become the overarching structure of how we learn Canada. Think, for example, how different the stories we tell would be if the themes that organized curricula were more like “Colonization and reconciliation; Resource, trade, and development; Constitutions, 1867 & 1982; Transnationalism and globalization; and Social justice, activism, and equity” rather than “First Nations, Métis, and Inuit peoples; French-English relations; Identity, diversity, and citizenship; Governance and economics; and Canada and the world”? How would these themes shift how we teach and learn Canadian history? How would our traditional ways of understanding the Canadian past deconstruct and bring to light new stories about what makes us Canadian? This tangent is not a slight on the Manitoba curriculum, in fact, I find the curriculum clear and well laid out, but the more I explore Canadian curriculum through this series, the more I see a narrative repetition in how Canadian history is structured, taught, and learnt. Given that this series is a development of an argument – an argument I discover and explore with every post – I’ll expand upon these thoughts in my final post in June. To return to the Manitoba grade 11 Canadian history curriculum, each “cluster” is one chunk of time, or “historic space,” in the history of Canada. Each cluster is organized around questions that students and their teachers are expected to explore throughout the term. Sometimes these questions are comprehensive (eg: Why did the Métis resist the westward expansion of Canada, and what were the consequences?) but more often they are exploratory (eg: How did the establishment of national institutions contribute to defining Canadian identity?). Manitoba provides many routes for teachers to explore these questions and develop their students’ “enduring understandings,” but each route is very much based in historical content, with an overview of the historical period outlined in each cluster. With specific questions as organizing curricular concepts, the teaching of Canadian history in Manitoba high schools should always be directed toward inquiry. But with pre-established questions, I wonder how much space there is for students to ask and answers questions of their own? As an outsider, my impression of Manitoba is that they attempt to be very student-centric in how their curriculum is constructed. I question, though, how student-centric is the curriculum in practice? What is your experience with the Manitoba curriculum? Please comment below about your experiences teaching or learning this curriculum. Dr. Samantha Cutrara is a History Education Strategist and is currently completing a manuscript for UBC Press entitled Creating a New “We”: Canadian history education for the 21st century. She recently published “The Settler Grammar of Canadian History Curriculum: Why Historical Thinking Is Unable to Respond to TRC’s Calls to Action” in the new issue of Canadian Journal of Education. Find more information about her consulting and academic work on her website SamanthaCutrara.com. Critique of this approach is not always from a right-wing point of view. You can see more of this critique in some of my other work.